A Ghanaian colleague of mine was making contacts in a rural area for Bible translation. In one particular village, he didn’t know anyone. So he parked his pickup under a handy mango tree for the shade. He made his contacts and left. He learned later that the village chief had passed away some time earlier and that two men were vying for the position. The mango tree under which he had parked belonged to one of them. That man then said that the vehicle parked under his tree showed that he had received an important visitor. He used that as a reason why people should support his bid for the chieftancy. My colleague unwittingly got involved in a bit of political intrigue. Working in cross-culture ministry means acting with insufficient information, especially at the beginning. You never know how people are going to interpret your actions. So some missionaries start out with a lot of trepidation that they will make a big mistake and ruin their ministry. That is highly unlikely. In any case, there’s not much you can do about it. Actually, there’s a lot we can do. Pray that missionaries will have wisdom and good relationships. When I trust God and have his wisdom I can live my life without worrying if I’m parked under the wrong mango tree. Back in February, we visited the area where the Siwu language is spoken. Siwu is a small language surrounded by a much larger language, Ewe (pronounced eh-vay). So everyone speaks both Siwu and Ewe. We spoke to the two men translating the Old Testament into Siwu. (The New Testament appeared a few years ago.) I asked what caused them to be interested in translating the Bible into their language. One said that previously he was a pastor and he used to preach in Ewe. But he occasionally preached in his own language. When he did, people did not fall asleep. In fact, they were very attentive. So when it was announced that there would be a translation into his language he jumped at the chance. What preacher, I thought, wouldn’t jump at the guarantee that his audience would all stay awake. An employee of the Ghana Institute of Linguistics, Literacy and Bible Translation (GILLBT), the organization we are on loan to, said this at an office staff meeting in August 2017. He said it full of joy. Judging from my other conversations with him, I know that he is not looking to spend his life working for GILLBT. So by “career” he did not mean lifetime employment. He meant “vocation” or even “call”. He has talked to me more than once about how missions is evolving so that he can plan a career in missions after his employment at GILLBT ends. He was hired when he answered an announcement at his church about a job opening in GILLBT. At the time, he was just looking for a job; money to live on. But as he learned about translation he began to feel a call. I have heard similar stories from other Africans involved in Bible translation. One told me how he met missionaries translating into his language and started working with them. He showed a flair for translation, so the missionaries asked his church to release him from his position as a pastor to work with on the translation full time. They agreed. Eventually he went on to do advanced studies in translation and become the leader of a program training African translators. He said he knew that it was all part of God’s call in his life. One of the best roles of a missionary is to be some part of God calling others to being a doctor, a human-right lawyer, a teacher, a Bible translator, or whatever, That is how ministry will continue through the next generation. Back in the early 1990s, my role lead me to read documents describing a program in Ghana to train Ghanaians as leaders of Bible translation projects. The program looked very interesting to me, so I began to follow it; reading reports and asking questions of people working in Ghana. But after the first cohort of Ghanaians went through the program, it stopped without explanation. However, I did hear that the people from that first cohort went on to lead translation programs. One of them even led translations in two different languages. So when I took an assignment in Ghana in 2011, I was pleased to meet all of them and hear their stories. Well, it is starting up again; not the same program exactly, but something close. Dayle and I were thrilled to be part of a send-off meal for five Ghanaians traveling to Israel for eight months to do intensive study of modern and biblical Hebrew in preparation for becoming experts in Old Testament translation. When they return to Ghana, they will train translators, do accuracy and quality checks on translations, and teach Hebrew to Ghanaians translators. These five will be the team of experts who will make sure that translations in Ghana will be accurate, clear and natural. They will also serve beyond Ghana. 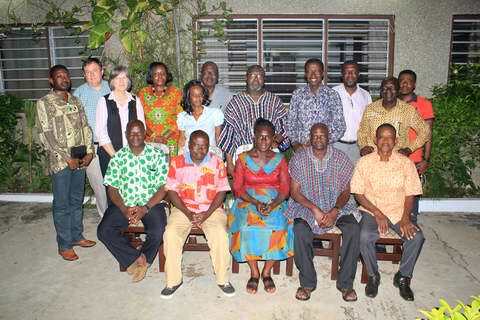 Even better, the training was largely organized by leading Ghanaian Christians. They intervened at various steps in the process to help with visas and other formalities. The board of the Ghanaian organization Dayle and I are loaned to, GILLBT, has also caught the vision for training their own. I am convinced that, as in the 1990s, this program will result in more and better translations in Ghanaian languages. Given the commitment and involvement of leading Ghanaian Christians, there will be more than one cohort this time. 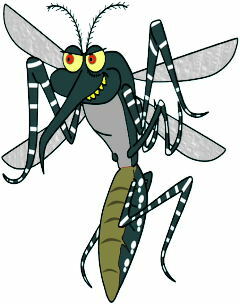 This week is national mosquito control week in the US. 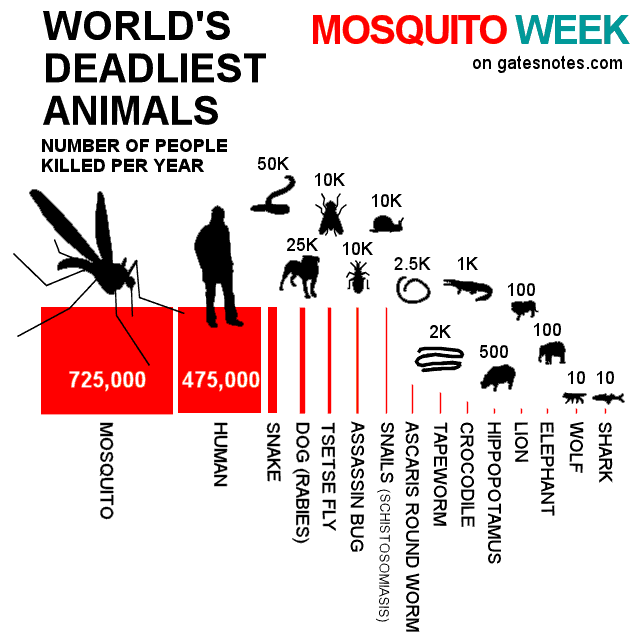 Worldwide, controlling mosquitoes is a big deal because they are, in fact, the world’s deadliest animal. Every 40 seconds, a child dies of malaria transmitted by a mosquito. Dayle and I have had colleagues whose children died of malaria. Here in Ghana, our Ghanaian colleagues in Bible translation regularly take sick days because of malaria or take time off work to go get tested. Some of my African friends involved in Bible translation spend days every year in hospitals with children, spouses or other family members who are very ill with the disease. In a 2011 survey, 72% of companies in sub-Saharan Africa reported a negative malaria impact, with 39% saying the negative impact was serious. Malaria not only kills, it reduces productivity. 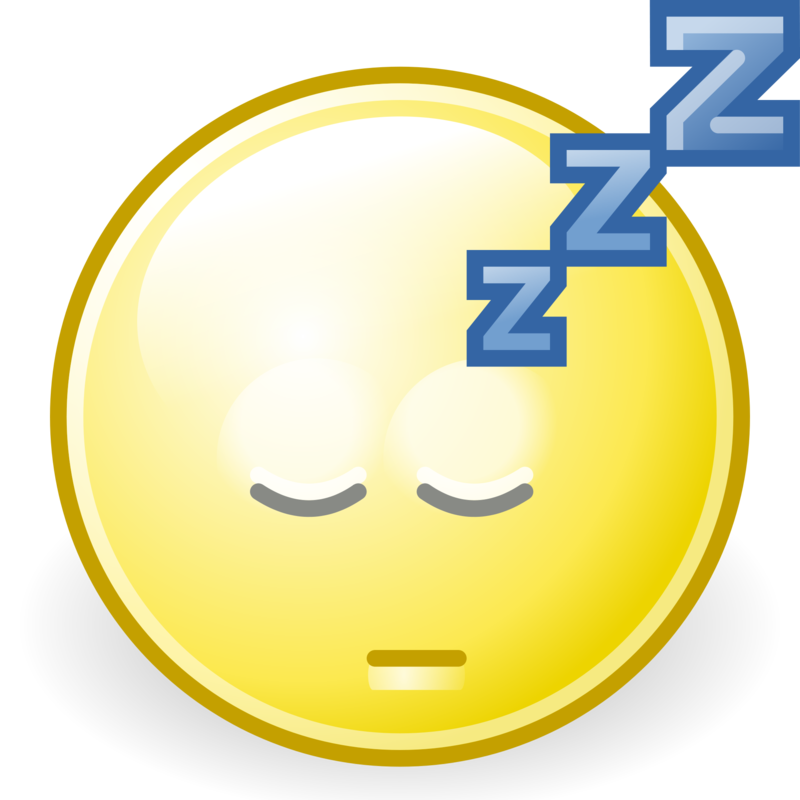 Translators’ work suffers when they are extra tired because malaria is depleting their strength but not yet making them sick. Malaria affects the education of their children. It has long been recognized that a malarious community is an impoverished community. In Sri Lanka, an outbreak of dengue fever, another mosquito-born disease, infected tens of thousands and killed hundreds. Dengue is a debilitating illness. When I contracted it, I was not able to work for two months. When you pray for national translators and others, pray for protection against malaria and other mosquito-born illnesses. One day back when we lived and worked in Burkina Faso, I found myself traveling through a town where the Bible was being translated into the local language. The translation was being done by another organization, but I knew the translators – a great team of local men. So I stopped to see them and perhaps encourage them. I found them busy in their translation office. It was great to spend a few minutes with them finding out how they were and how the translation was going. I get it. When reading Job I’m tempted to read the first two chapters then skip the next 39 to finish with chapter 42. If reading chapters 3 through 41 can be tiresome, can you imagine translating sentences like this day after day? God has emotions. When God speaks to us through his Word, that can cause an emotional response. Let’s not think that only certain emotions are allowed – that we have to have only “holy” emotions. I find it instructive that those translators found the opinions of Job’s friends to be tiring. God wants our honest reactions to his Word. As a white person living and working in Sub-Saharan Africa, I am immediately identified as a foreigner by the color of my skin. When I first came to Africa, the organization I world for was staffed almost exclusively by white people coming from North America and Europe. We hired some local staff for low-level jobs, but all the missionaries were white. It was very obvious that the organization itself was foreign. Over the years the situation has changed radically. 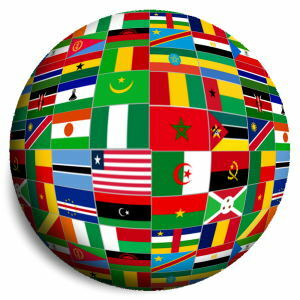 Most of the staff in the offices, on the translation centers and in the translation projects are Africans. But it’s still a foreign organization. I’ll illustrate this with an example. Let’s say that a foreign government sets up an office in Washington DC to lobby for its interests. It hires an American lobbyist and sets him up with other American staff – a receptionist and so on. The lobbying office is still a foreign thing even though all the staff are Americans. What makes it foreign is who it represents, and where it gets its orders. What continues to make Bible translation foreign in Africa is no longer that it is staffed with foreigners. It is that the shots are still called somewhere else. 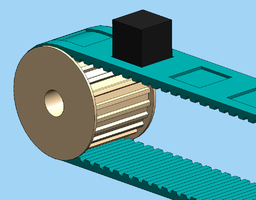 One of my African friends likens what is happening to a conveyor belt. Money, people and ideas about Bible translation are put on a conveyor belt in the West and conveyed to Africa where offices staffed by Africans receive the ideas, add little by way of African ideas or resources then deliver the packages throughout the continent in the form of translation programs guided and resourced by the ideas and money put on the conveyor belt somewhere else. As long as this situation persists, Bible translation will stop when those in the West stop putting their ideas and money on the conveyor belt, it will be reduced they they reduce what they put on – just like a delivery office (such as Fedex) can only deliver the packages it receives. It will go bankrupt if no one sends packages. The real work of making Bible translation less foreign is more radical and more difficult than changing the staffing of the delivery office. Someone will have to change the delivery service into a factory producing its own product to deliver. The next step in removing the foreignness of translation in Africa is having churches and Christians in Africa owning and shaping translation to fit their reality. By the way, in this scenario Westerners still have a role to play because the issue is not where the staff comes from but rather who defines the vision and calls the shots. I see my primary focus, whatever my role, in facilitating a process where Africans and their churches design and implement their own translation programs. I am fascinated to watch how this is starting to happen – here and there, slowly at first, picking up speed. 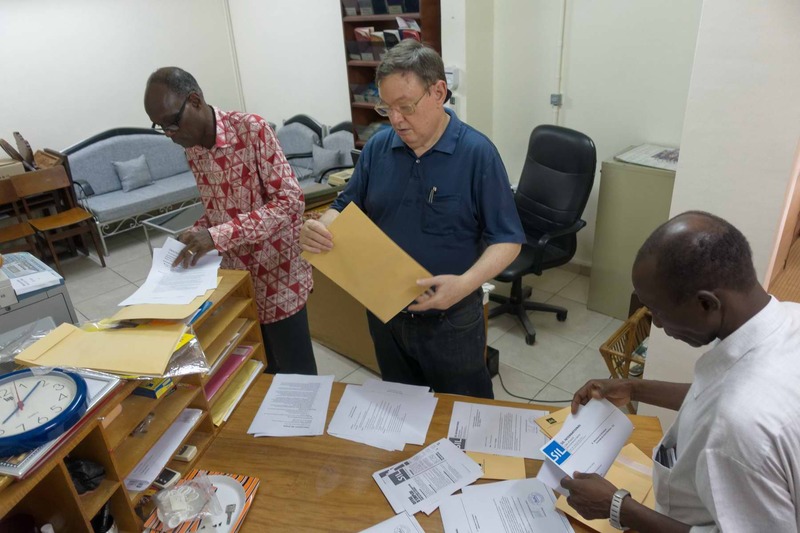 At the end of my time as Director for Côte d’Ivoire, I was moving from files for the incoming Director. That meant labeling a file drawer. 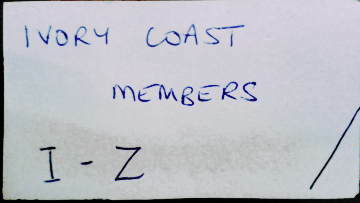 The drawer was previously labeled “Members “I-Z”. That meant that when that label was made, it took two file drawers to contain the personnel files for the members (meaning missionaries from the West) who worked in Ivory Coast and this drawer contained those whose last name started with a letter from I to Z.
I was amused. It took me back to the time when Bible translation was lead and motivated by missionaries coming from the United States, Great Britain, Switzerland and other western countries. In fact, that situation lasted for the first 20 years I was in Africa. This simple file drawer label took me back to that time. Dayle and I were in Ivory Coast temporarily and I had just handed over to an Ivorian Director. There was one another American couple here and they were temporary too. Besides the four of us, there were no western missionaries residing in the country doing Bible translation. It only took a few hanging folders occupying a small part of one file drawer to contain all their paperwork. But there are translations ongoing in 19 languages and those files are voluminous. One of the big changes in Bible translation in Africa over the last two decades is the ascendancy of national translators and related personnel and the steep decline in the number of western missionaries working directly or indirectly in translation. This change was foreseeable from the early 1990s. It began happening in the mid 1990s and accelerated after the year 2000. I have met a number of missionaries working in Bible translation who found these changes troubling. They ask what we are doing wrong, or what the church back home is doing wrong. Once, when I described the changes, a fellow missionary told me “You do nothing but discourage me.” This was in spite of the fact that we had a number of highly trained Africans ready to fill the gap; some with more training and experience than some missionaries. The Lord spoke to me in a vision after King Nebuchadnezzar of Babylonia had come to Judah and taken King Jehoiachin, his officials, and all the skilled workers back to Babylonia. In this vision I saw two baskets of figs in front of the Lord’s temple. 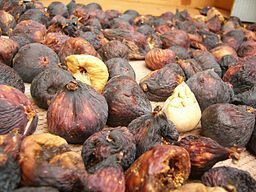 One basket was full of very good figs that ripened early, and the other was full of rotten figs that were not fit to eat. You will agree with me that those who had been forcibly removed form their homes and taken to a foreign country were unfortunate while those who were left in their county were fortunate. But God goes on to say the opposite – that those who were taken away from the country and their homes by force are the fortunate ones; but those who remained in their country and their homes are unfortunate; the bad figs are really the good figs and vice versa. God has a radically different interpretation of the events and his interpretation was confirmed over coming decades. When we experience disappointment or other negatives, we need to ask God to give us his view of the events. One of the challenges in missions is for missionaries to seek God’s view of the trends that are happening rather than relying on our gut instinct. I have come to the conclusion that shrinking missionary workforce and the increased number of nationals is not someone’s mistake. It is God’s doing. If we try to fix it we are actually working against God. Now this does not mean that there is no room in Bible translation for Western missionaries. Quite the contrary. God calls who he calls without regard to nationality, race, gender or anything else. The question is not whether there is a place in Bible translation for Westerners, but rather whether God has called you and whether as a missionary you will work to promote the directions God is taking Bible translation or work against them. A workshop where translators from five languages perfected their translation of the book of Romans. 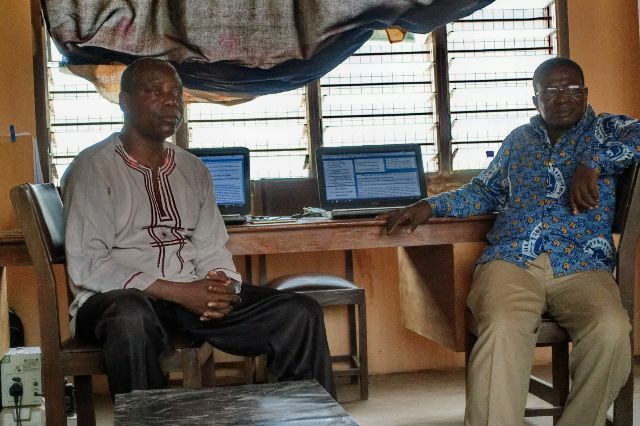 On June 23, I wrote about changes that came out of the conflict and civil way in Côte d’Ivoire. Those changes have sparked some interesting conversations in my temporary role as country director. Ivorians and other Africans are doing most of the translation checking. Translation checking is a quality control process where a person with high level training and lots of experience looks over a translation verse by verse to check that it is faithful to the original and that it is clear and natural. One of the Africans doing that is doing it part-time. He has a very good job doing something else, but that job allows him time to check translations and train translators. Someone expressed the opinion that this indicates that he is more interested in money than in translation. Historically, translation checking has been done by full-time Western missionaries or consultants with the Bible Societies. It is new that Africans are doing it part-time while making their living at other jobs. It is not the first time that a colleague has expressed to me a similar opinion. First, we are short of consultants and we don’t have the money to hire more. So part-time consultants actually fit better. In fact, there are other Ivorian who could be part-time consultants with a little more experience or training, but that hasn’t happened out of concern that it we trained them we wouldn’t have money to hire them. There is enough money to bring them into part-time positions. Second, and more importantly, that is how Africa works including the church in Africa. I meet a good number of Africans who have good jobs or small businesses who also serve as pastors to local churches who cannot afford to hire a full-time pastor. In fact, one is on a committee giving me advice in my temporary role. 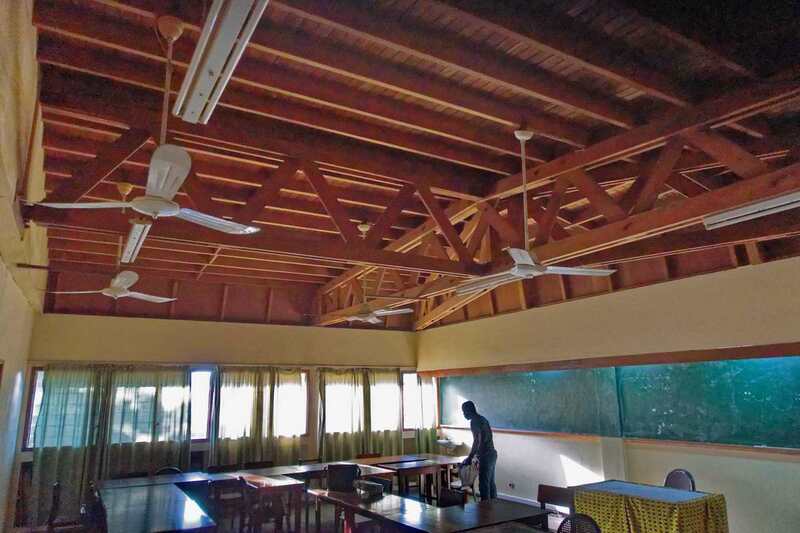 A Bible College in the Congo found that the churches made most of its graduates headmasters at church schools because the schools receive a government subsidy for headmasters and teachers. The graduate then pastors a church on a part-time basis. Whether we think that this way of doing things it good or bad, it is the way things work. Historically, the most of the first Bible translations done in European languages during the reformation were done by part-time translators. John Wycliffe, who did the first translation into English, did his translation while teaching at Oxford, lecturing and pastoring. Martin Luther did his translation into German while employed as a priest and university lecturer. Even the King James translators were not employed full-time on the translation. People serving part-time in translation is a long-standing practice in the church worldwide, even if it has been eclipsed by full-time translators in the last 200 years. Dr. Sherwood Lingenfelter, an anthropologist and friend of Bible translation, came to Africa and taught on partnership. He told us that we ought to be doing “organisational exegesis” with our African partners. That is, we need to understand how African churches and other partners work – how they make decisions, how they pay staff, etc. It seems to me that a serious look at the church in Africa reveals that having part-time staff is a regular part of how it operates. Because of that, it seems inevitable that as the church here exerts more decision-making in Bible translation, more part-time staff will become part of the picture. We westerners who are used to the full-time-ministry model need to stop thinking of those who work part time as less than fully committed. 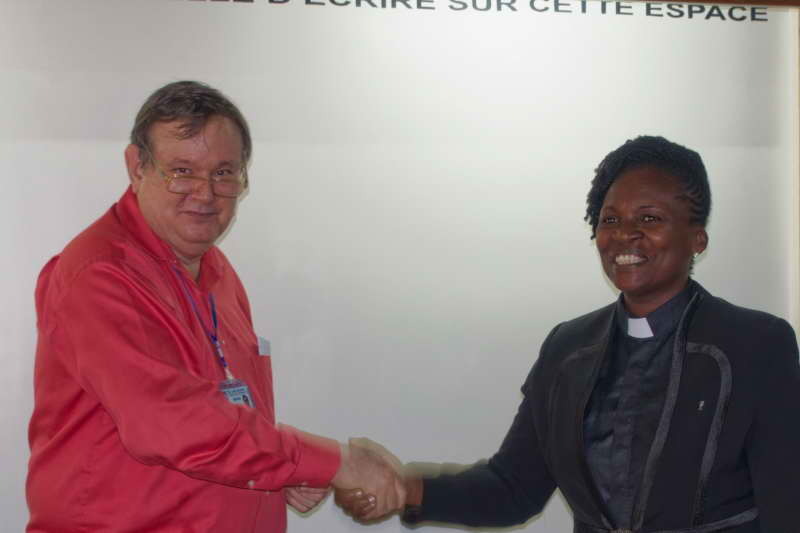 I am filling in temporarily as the director for translation work in Côte d’Ivoire (also known as Ivory Coast). If things go according to plan, we’ll be back in Ghana in a few months. 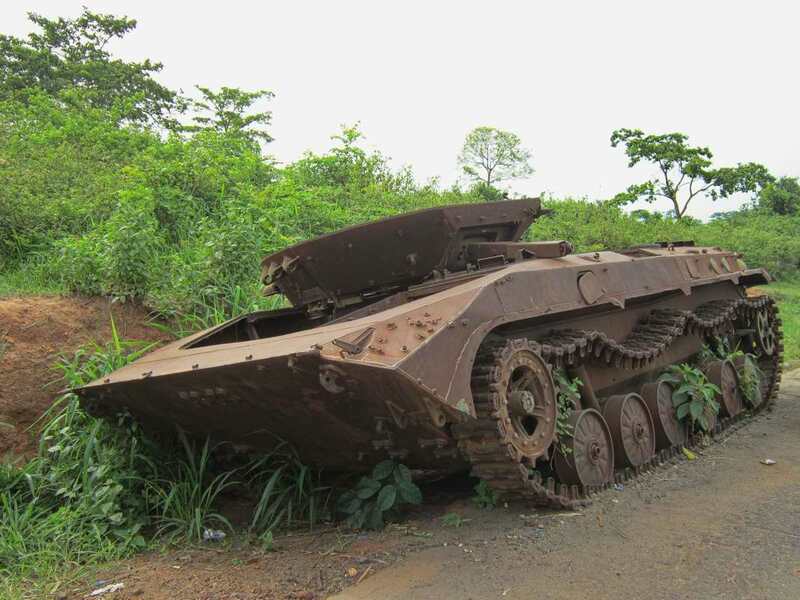 Abandonned armoured vehicle in Ivory Coast. Photo courtesy of a colleague. Ivory Coast is coming out of prolonged period of conflict and civil war. During a good part of that time, many missionaries and almost all Westerners doing Bible translation left the country. That left the Ivorian translators on their own. Instead of stopping, most of them kept translating. Coming out of the conflict, we have a very different situation than we had going in. There are still outsiders involved, but like Dayle and I, most of them play limited roles. Ivorians are the translators, they lead the translation programs, provide expert guidance, do the training and provide quality control. But the change is more profound than than just changing the faces around the translation table. Churches here are picking up the will to do translation. They sponsor translation programs, choose translators and take care of some of the administrative details. Some have been quite active in doing adult literacy among their members. 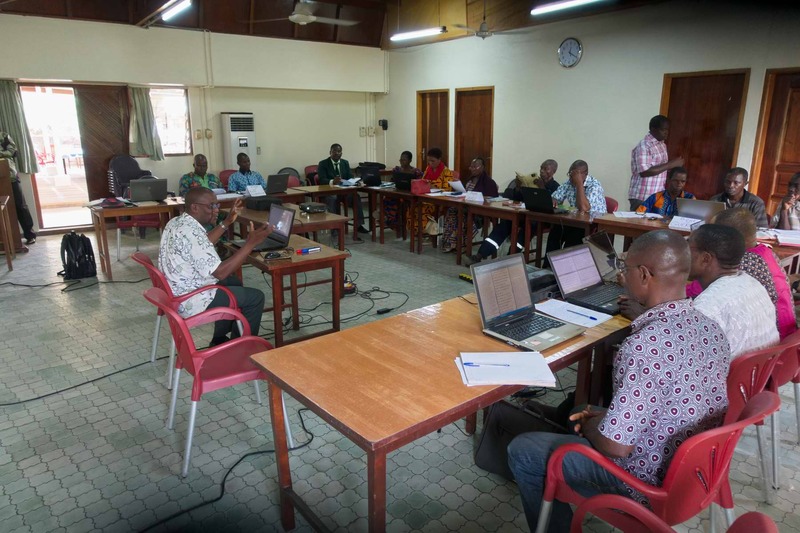 I am working with a group of Ivorian Christians who want to reformulate how Bible translation is done so that it fits their way of doing things. They think that will give the translations even more impact. I agree. David could not use Saul’s armor. The church in Africa will not do Bible translation the way you do. Africa is considered inconsequential by many, just as Saul thought David inconsequential. Might Jesus’ church in inconsequential Africa devise a way to translate the Bible into its 1,800 languages that no translation expert would ever recommend and yet succeed by doing it their way? I believe that is exactly what will happen. The conflict in Ivory Coast forced some changes in Bible translation. 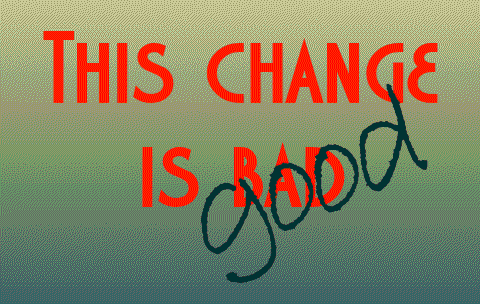 Those changes are opening the door to more profound changes. I say: Be on the lookout for falling giants. The meeting room at the translation center in Abidjan. Bullets came through this roof doing the conflict.